Nadir Afonso, GOSE (4 December 1920 – 11 December 2013) was a Portuguese geometric abstractionist painter. Formally trained in architecture, which he practiced early in his career with Le Corbusier and Oscar Niemeyer, Nadir Afonso later studied painting in Paris and became one of the pioneers of Kinetic art, working alongside Victor Vasarely, Fernand Léger, Auguste Herbin, and André Bloc. Nadir Afonso achieved international recognition early in his career and many of his works are in museums. His most famous works are the Cities series, which depict places all around the world. 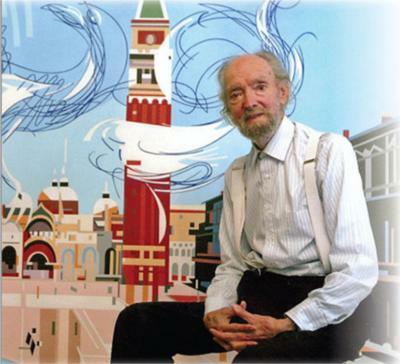 He was known to have painted into his later years and died on 11 December 2013 at a hospital in Cascais. During his life he achieved great honors, representing his country at the finest level. Nadir Afonso Rodrigues was born in the rural, remote town of Chaves, Portugal, on December 4, 1920. His parents were Palmira Rodrigues Afonso and the poet Artur Maria Afonso. His very unusual first name was suggested by a gypsy to his father on his way to the Civil Registry, where he was due to be registered as Orlando. By the age of four, he made his first "painting" on a wall at home: a perfect red circle, which anticipated his life as under the signs of rhythm and geometric precision. His teen years were dedicated to painting, and he won his first national prize at age 17. It was only natural that he was sent to the bigger city of Porto to enroll in the School of Fine Arts to pursue a degree in painting. However, at the registration desk, he took the advice of the clerk, who told him that his high school diploma allowed him to enroll in Architecture, which was then a more promising career. As he later admitted, he made a mistake by listening to that man. Nadir Afonso took on the challenge and graduated in Architecture, though he flunked the third year because some of his professors could not accept his artistic style. Settled in Porto, he started to design houses and industrial buildings, while at the same time painting the city around him under his other surname, Rodrigues. As a member of the artist collective Independents, he took part in all their art exhibitions until 1946 and became a favorite with the national critics. His oil A Ribeira was purchased by the Contemporary Art Museum of Lisbon in 1944, when he was only 24 years old. In 1946, Nadir Afonso left Porto for Paris with a number of unfinished works from his "Iris period", and changed his signature with the surname Afonso. There, a Brazilian painter Candido Portinari helped him secure a scholarship from the French Government to study art and painting at the École Nationale Supérieure des Beaux-Arts. He resided at the Hôtel des Mines in the Latin Quarter and spent his time regularly at students hangouts. Nadir Afonso recalls this period of his life as the first time that he was in contact with the great world of art. Because his scholarship lasted only one year, Nadir Afonso worked until 1948 (and again in 1951) with the architect Le Corbusier who, knowing his passion for painting, gave him the mornings off without cutting his salary. He also worked for a while, with the artist Fernand Léger. Artworks of Nadir Afonso are removed from WikiArt due to a copyright infringement notice.